The Dental Anthropology Association (DAA) is seeking nominations for an Executive Board Member (3 year term). This member will be responsible for being a meeting facilitator. Responsibilities include coordinating with the American Association of Physical Anthropologists (AAPA) and the local hotel to make arrangements for workshops, special events, and the DAA Business meeting. Please submit nominations to Christine Lee (christinelee70@gmail.com), the head of our Nominations/Elections Committee, by APRIL 1. You may nominate yourself or another member. Please include the email address of the nominee in your submission email. Nominations will be announced during the Dental Anthropology Association Business Meeting (Friday April 13, 8:30-9:30pm, Room Texas V/VI) for a vote. Attending this year's American Association of Physical Anthropologists meeting? Interested in dental anthropology? Sign up for this hands on workshop with Dr. Simon Hillson and learn how to record and interpret evidence of dental plaque-related diseases in archaeological samples. Are you a student attending this years AAPAs? Are you presenting a paper related to dental anthropology? Apply for the Albert A. Dahlberg Prize! Register for "Let's Do Lunch" at the AAPAs! The Dental Anthropology Association presents Let's Do Lunch! The goal of this gathering is to match students with professors for one-on-one conversations about dental anthropology at the AAPA meetings. Traditionally, professors and professionals sponsor the lunch of up to 3 students. The time will be announced as soon as the AAPA Meeting Program Schedule has been posted (it will fall during the lunch break of Friday, April 13). We have room for ~30 people and spots will be filled on a first-come, first-served basis. Turner-Scott Dental Anthropology System (ASUDAS) plaques now available! The Dental Anthropology Association is pleased to announce the addition of The Turner-Scott Dental Anthropology System (ASUDAS) dental plaque set on Bone Clones. From the website: "The Turner-Scott Dental Anthropology System dental plaques are a series of 24 reference plaques that highlight human tooth morphology and variation. Created by Dr. Christy G. Turner II, Dr. Christian R. Nichol, and Dr. G. Richard Scott, this standardized collection of plaques showcase non-metric tooth crown and root traits that are found in a given human population, as well as showing the degree of expression of each trait. Included with the set of plaques are an annotated bibliography of references and a history of the dental plaque system written by one of the original developers of the DAS standards, Dr. G. Richard Scott. A portion of sales will go to the Dental Anthropology Association to help fund student activities and research. This set comes packaged in a sturdy box with 3 foam trays that hold the plaques securely to allow for convenient storage and transportation. " "We are pleased to announce the official launch of the new website for the journal! 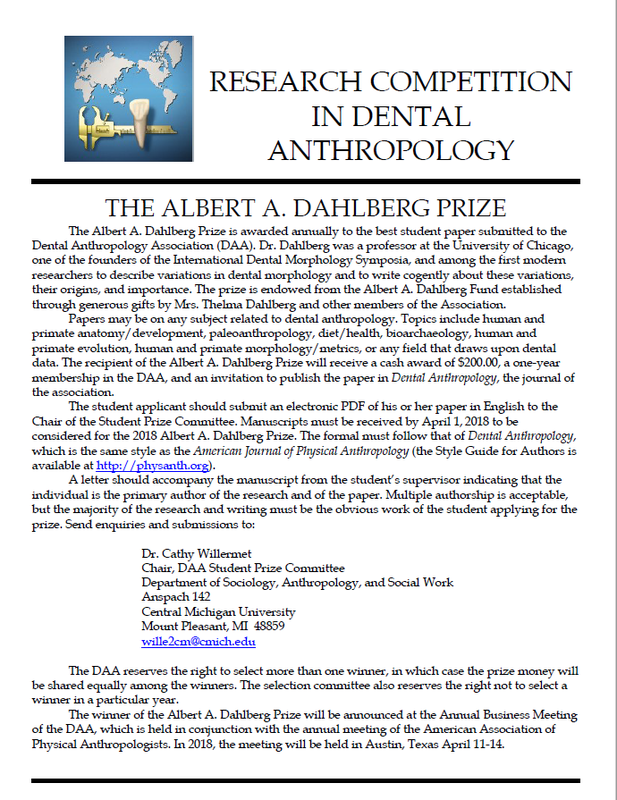 Authors can now submit manuscripts via the Dental Anthropology Association website at the following link: journal.dentalanthropology.org. Hopefully, this move will ease manuscript submission for authors and streamline the peer review process. This website will also serve to house all the back issues of the journal. This move should make it easier to find content published in the journal and increase its visibility. We would like to reiterate our commitment to open access and accessibility of the journal and the research housed within. All content will continue to be made available free of charge. As the editors, we are excited about the direction of the journal, and look forward to reading future submissions." The next edition of our journal will be hosted on the new website. Until such a time, all editions will continue to be available here. First journal issue of 2016 and new style guide are here! We may be a bit behind on releasing Dental Anthropology issues, but have no fear! The first issue of 2016, volume 29, has arrived! We have also released a new style guide for contributors to help the process move along much quicker, so we can bring you the latest and greatest in the dental world. Find them both on the journal page- here!